In this level, the Spike Bass returns. Mario must jump onto the wooden logs, some of which fall when stepped on, while avoiding the Spike Bass and jumping Cheep-Cheeps. The first Star Coin is found by going under the logs into the water, then jumping onto the Star Coin. The second Star Coin is obtained in the same way. Mario can get the last Star Coin by going through a red Warp Pipe near the end of the level. After the final Star Coin is the Goal Pole. 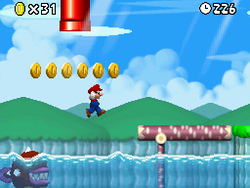 Star Coin 1 - Mario should use the falling platforms to reach the first Star Coin. Star Coin 2 - After the checkpoint, the second Star Coin is below a rock formation. Mario will need to go underwater and under the formation while avoiding the Spike Bass. The Star Coin is easier to collect if Mario defeats the Spike Bass. Star Coin 3 - After hitting the P Switch, Mario should run all the way to the end of the level and jump into the red pipe. Mario will fall on the Star Coin and appear next to the Goal Pole. This page was last edited on November 24, 2018, at 07:18.